I’ve watched RED HOOK SUMMER three times now and I still can’t honestly say what I think of it. Which in a way I think is supposed to be the point. I’ve always admired Spike Lee as a filmmaker in his insistence on telling stories that don’t have Hollywood resolutions and endings. That’s because the issues Spike raises in his movies don’t have nice tidy endings where everybody rides off into the sunset happy and joyous. Spike Lee’s movies are about the issues that most of us don’t like to talk about honestly. Race, how the media contributes to the corruption of intelligence, creativity and spirit and urban crime just to name a few. I remember how much trouble he got into with the African-American community when “School Daze” hit the theaters as a large part of the movie’s story dealt with racism among African-Americans regarding skin tone and having “good” and “bad” hair. Black folks were ready to hang Spike behind that one as they felt that was an issue that should stay within the black community and not for public knowledge. He’s always been a controversial artist and is well known for his public disagreements and arguments with other filmmakers. But he’s got passion for his work. Even in movies like “She Hate Me” and “Girl 6” two films of his that I have not the slightest idea who he thought would be interested in seeing. And there is a whole lot of passion in RED HOOK SUMMER but there’s also a lot WTH as well. 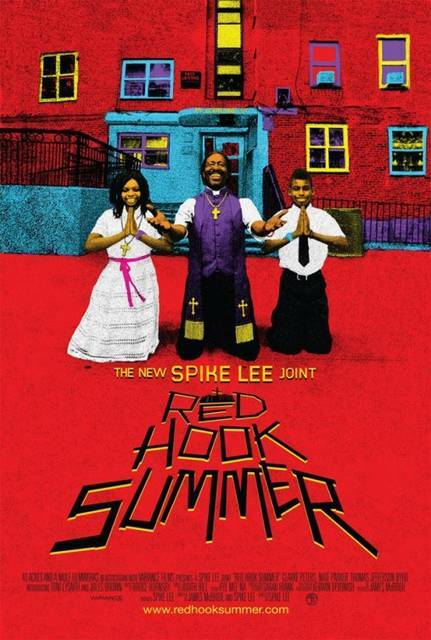 Flik Royale (Jules Brown) is brought to Brooklyn’s infamous Red Hook housing project by his mother Colleen (De’Adre Aziza) to spend the summer with his grandfather, Da Good Bishop Enoch Rouse (Clarke Peters) Flik is a spoiled, arrogant little snot who openly displays disrespect and contempt for the situation he’s in. Having been brought up in Atlanta he knows nothing about the streets, something that his grandfather continually warns him about. It doesn’t help that Flik wanders around past the neighborhood drug dealers and gang bangers with his iPad in front of his face constantly, obsessively recording everything he sees. 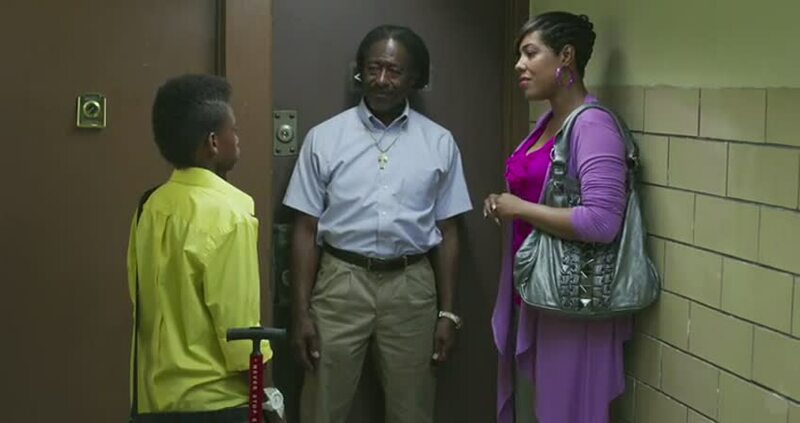 Bishop Enoch puts his grandson to work at The Lil’ Peace of Heaven Baptist Church where Flik meets Chazz Morningstar (Toni Lysaith) who will become his best friend during the course of the hot Brooklyn summer. But just when I thought that this was going to be a movie about a young man’s coming of age and spiritual awakening, Spike Lee quickly changes gears so fast that I had to rewind the movie back a bit to make sure I hadn’t missed something. Now, I can’t tell you what shakes up this movie so dramatically just in case you decide to see it but let me say this. That one event drastically changes everything and will cause you to ask: “Well, if Character A knew this about Character B then why put Character C with Character B in the first place.” And that’s as close as I can come to what happens without spoiling it. Most of the time I don’t give a poobah’s pizzle about spoilers (A pox on The Spoiler Police, says I and damn them for puking clackdishes) but in this case, spoilers are warranted. This is one odd movie in terms of when it’s supposed to be taking place. Except for Flik’s iPad there is no other sign of modern technology in this movie. Carmelo Anthony is prominently mentioned but there’s no cell phones, no flat screen TV’s, no iPhones. No brand name designer clothing. Chazz speaks in 1970’s slang that she definitely could not have heard from other girls or boys her own age or from adults. In fact, everybody dresses like they were from the 1980’s and the movie could easily have been set during that period. What’s not odd is the powerhouse performance of Clarke Peters. Before this, I only knew his work on “The Wire” and was impressed there. But in RED HOOK SUMMER he’s way more than impressive. He’s downright nuclear. If you decide to watch RED HOOK SUMMER for any reason, Clarke Peters should be it. And no other filmmaker can so convincingly put Brooklyn on the screen than Spike Lee. I know Red Hook and in just about every shot of RED HOOK SUMMER I recognized where he had filmed. What else can I say about RED HOOK SUMMER to wrap up this review? Oh, there are two cameos in the movie, one amusing and the other troubling to me. The amusing one is by Tracy Camilla Johns who is introduced to Flik as “Mother Darling” and it wasn’t until talking about the movie with Patricia later on that I realized that Ms. Johns was reprising her Nola Darling character from “She’s Gotta Have It.” I wouldn’t dream of telling you how she shows up in this movie. The other cameo is by Spike Lee himself, playing Mookie from “Do The Right Thing” Mookie is obviously older, sporting a gray beard and hair but he’s still delivering pizza. To be honest, I’d have liked to have seen Mookie as a businessman owning his own pizza parlor or even a chain of them. Apparently the character has not improved his lot in life since 1989 and that saddened me because I wondered if Spike Lee saw so little in what is one of his most beloved characters that he could not envision any sort of productive future for him or if this was Spike Lee making a self-commentary on his own life. Or maybe a cigar is just a cigar. So should you see RED HOOK SUMMER? It feels to me strongly like a work still in progress. The screenplay could have used some tightening up of the screws and nuts here and there. But at the same time it’s sheer rawness and sometimes sloppiness of acting and plot has its own power that cannot be denied. Like I said at the beginning of this review, I’ve seen the movie three times now and still can’t make up my mind if I like it or not. See it for yourself and then we’ll talk some more. Rated R: There is a scene involving the seduction of a young child that while it isn’t graphic it leaves absolutely no doubt as to what is going on.